Operation Twilight – Leave a light on this winter! With autumn now upon us and the nights drawing in, Sussex Police are encouraging residents to leave a light on this winter. Leaving your home during hours of darkness, without putting a light on or drawing the curtains, is an open invitation to the opportunist criminal that there is no-one at home. This simple message is one of the key themes of this year’s “Operation Twilight” campaign – which offers valuable advice on how to go about ensuring burglars are left in the dark during the winter months. It sounds simple advice, but when it is dark outside people don’t always think to draw their curtains or leave a light on if they are going to be out. To the opportunist burglar, it is almost an invite. A house that is in darkness is the easiest target as no-one is likely to be home. It doesn’t take long for a burglar to get inside and steal property, particularly things that are easy to sell such as televisions, videos, computers, jewellery and antiques. Unfortunately, every year sees a spate of early evening burglaries associated with the clocks going back and Sussex Police will be distributing Operation Twilight flyers throughout the Force area. Between January 1st and the end of July 2006 the number of burglaries in Sussex had reduced by 21%, meaning 1,388 fewer victims in real terms. This is the biggest year-on-year percentage reduction for more than a decade and Sussex Police want to ensure this success continues. The Tameside Advertiser has reported that their local Police force will be out on the streets this week as they continue their campaign to reduce burglaries in the run-up to Christmas. They stated that the initiative known as “Operation Storm” was launched earlier this year in response to a 10 per cent rise in burglaries across Greater Manchester. Since July Police have slashed the number of burglaries in the borough by 65, compared to the same period last year, and have pledged to carry on with help from the public. Dedicated teams of officers will be sent out to arrest suspects, visit known offenders and reassure victims of burglary. They will be patrolling the streets handing out crime prevention advice in hotspot areas and promoting the www.immobilise.com where residents can register their valuables online to make it easier for police to identify them if stolen. The level of assistance residents have shown the police in tackling burglary is to be commended. The community will not support criminality and there is no hiding place for those people who choose to break the law. Storm sends a clear message to would-be thieves that the police are working around the clock to prevent crime and bring those people who choose to commit offences to justice. In the last 6 months in Bath and North East Somerset 144 laptops have been stolen (1st April to 30 September 2009), 80 from houses and other dwellings; 24 from commercial burglaries and 9 from vehicles and the rest being general thefts. When new students arrive in the area with new high value items such as laptops, ipods and phones there is an increase in theft as the opportunity to steal is easier with students being less vigilant of their property when they first arrive. To combat this Police in Bath have been working hard at Freshers Fayres and talking to students generally about keeping property safe. 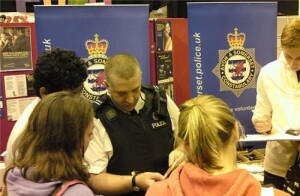 On Friday 2nd October at Bath University Freshers Fayre thousands of property marking UV pens were given out, advice given on crime prevention and hundreds of students registered their phones on www.immobilise.com, a national property register that records details so property can be returned or traced if stolen. A student house to a burglar can be a playground to take several high value items in one go. Students can keep themselves safe however by just following a few simple guidelines. Keep all high value items out of sight and away from windows where they can be easily seen. Secure all doors to your property at all times and know who has keys to come and go. road.cc. the popular online cycle news site has published an interesting story concerning and expected rise in bike crime as students return to university this month. Cambridge is one of the worst effected cities as accoring to road.cc there were 1,433 cycle thefts between January- July, prompting a police crackdown on the crime, but there is a massive increase in bikes being stolen during autumn as 30,000 university students arrive in the city. In October 2006 and 2007, more than 300 bikes were stolen, and this compared to 140 in April 2006 and 170 during the same month in 2007 and 2008. The figure fell to around 225 last year, but due to the increase in bike thefts in other months this year police are expecting a record number this month. I hope the publicity campaign helps but I am still worried and very concerned at risk of a major outbreak of thefts in the autumn and the high theft figures through 2009. There is organised theft across the city of bikes not locked to fixtures and the problem of new bikes and new students in the autumn. Cycle theft is probably the biggest readily reducible set of crimes in the city and as Cambridgeshire Chief Constable Julie Spence and others like me have said, it needs a far tougher set of initiatives to crack it. Sgt Gordon Morgenthaler of Cambridgeshire Police has teamed up with Cambridge City Council and the Cambridge Cycling Campaign as well as cycle shops in the city to raise awareness about the crime, and he is asking people to register their bikes on immobilise.com. The Bolton News has reported that students have been given tips on how to avoid becoming victims of crime. Police from the Bolton Central Neighbourhood Policing Team have been at Bolton University all week, marking property and registering students’ laptops and phones on the Immobilise database. They have also been giving advice and crime-prevention tools displaying GMP’s new student safety campaign logo. Every year, we run safety campaigns aimed at providing students with advice to prevent them becoming a victim of crime. However, for new students in particular, crime prevention is always going to be the last thing on their minds when they are leaving home for the first time and they are likely to think it will never happen to them. Local neighbourhood officers were on hand to meet and greet the new students and their parents, to remind them of how they can keep themselves and their valuables safe. Safety messages are also being sent each week to student’s phones in the area. Students can follow simple steps to help stop thieves, including keeping valuables out of sight, always being aware of what is going on around them, keeping to well-lit areas and shutting and locking all windows and doors, even when they are at home.